All the candy-colored visuals and outsized performances in Underland can't make up for this sequel's thoroughly unimaginative story and cookie-cutter execution. Disney’s first trip down the rabbit hole, Tim Burton’s Alice in Wonderland, made over a billion dollars globally six years ago, a staggering figure that has led some to surrender to the tide of popular opinion (combined, of course, with the haze of nostalgia) and start believing it was actually good. A supremely confusing, color-blasted concoction, Alice exposed Burton’s biggest weakness – that is, basic coherence – more thoroughly than any of his previous cinematic outings, and did so whilst failing to infuse any of the director’s Gothic imagination or endearing weirdness. It was, at best, a great coffee-table book, overstuffed with resplendent visuals – but calling Alice in Wonderland even a decent film would be to do it a great kindness. The problem with adapting Lewis Carroll’s lackadaisical, topsy-turvy stories for the big screen is that they defy storytelling convention by nature. Burton was right to delve into the fantastical tableaus of “Underland” – but he wound up lost amid the visual wonder, with no hope of straightening out an already zig-zagging, up-in-the-air narrative. And yet… Alice in Wonderland made over a billion dollars. So the only real question to beg of Alice Through the Looking Glass is: what took so long? 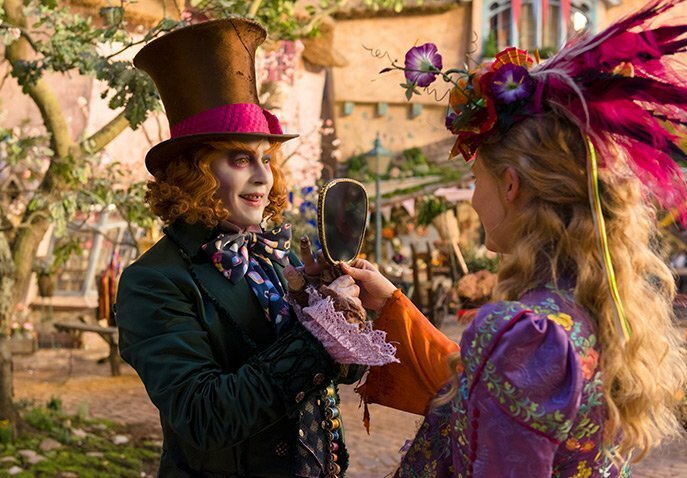 That’s right – Disney almost certainly had its sights set on turning Wonderland into a franchise from the second those box-office receipts came rolling in, so that half a decade has passed between the first Alice and this follow-up is enough to warrant a raised Hatter eyebrow or two. The bulk of the time, it seems, was spent attempting to figure out a story that could justify a return trip to Underland, one that could sustain a feature film without short-changing characters, alienating fans of the first, or revisiting all the same plot points. And while that time wasn’t wasted, per se, watching Alice Through the Looking Glass gives the impression that it may have been mismanaged. Directed by James Bobin, whose strengths are in comedy (he helmed both of the terrifically funny, new Muppets movies), the new film echoes the original’s “return to Wonderland” set-up by reuniting with its heroine (a charming Mia Wasikowska) as she intrepidly sails the high seas as the captain of her father’s ship, evading adversaries with Desperaux-esque daring and a pinch of peculiarity. The opener, a nautical chase that feels like a fever dream both in terms of big-eyed, on-the-nose dialogue (“You know my stance on that word,” Alice says, sternly reprimanding her first mate for calling a maneuever “impossible”) and souped-up CGI imagery, sets the tone for what’s to come. Back in England, Alice finds that her snobbish old suitor Hamish (Leo Bill, appropriately snivelling) has contrived a new dilemma with which to box her in, forcing a financial decision between her father’s ship, subtly named the Wonder, and her mother’s home. Infuriated, she storms off, lamenting that she might have to “sign over the Wonder and give up the impossible” – two things she vowed never to do. Almost immediately, though, she’s accosted by a familiar blue butterfly and, stepping through a mirror, finds herself back in Underland. Unfortunately, that change of setting throws the fearless-feminist trappings of Alice’s London subplot by the wayside. No sooner than has she arrived than does Alice discover that the Hatter (Johnny Depp, bonkers and bizarro as he was the last time around) has fallen gravely ill, grief-stricken and sporting a deathly grey pallor after realizing that no one will believe his family, incinerated by the Jabberwocky years prior, may have in fact survived. All are helpless to do anything, save Alice, who takes on the mission of traveling back in time with a device called the Chronosphere to rescue the Hatter’s kinfolk and restore him to his usual, sprightly self. It’s in this threadbare plot point – Let’s go back! To the beginning! – that the cracks in Alice Through the Looking Glass‘ cheerily blithe facade become apparent. Unlike Burton, Bobin isn’t secure enough in his eye for distinctive visuals to let them exclusively run the show. Instead, Linda Woolverton’s rather workmanlike script takes priority, hijacking the film to tell what amounts to a stock origin story for not just Depp’s Hatter but Anne Hathaway’s aloof White Queen, Helena Bonham Carter’s irascible Red Queen, and even (to a lesser degree) the rest of the crew, including younger versions of Tweedledum, Tweedledee (Matt Lucas playing both roles), and the Cheshire Cat (Stephen Fry). To a degree, everything in the first 40 minutes of Alice Through the Looking Glass is inessential, getting Alice back to Underland and off on a quest that pulls in every familiar face from the previous installment as if checking off boxes on a shopping list. It’s only once Time appears, personified with scenery-chewing glee by a mustache-twirling, European-accented Sacha Baron Cohen, that the film gets an injection of anything even remotely novel. Time, a man-robot hybrid who fancies himself Underland’s chief deity, is the owner of the aforementioned Chronosphere, and he’s none-too-happy about Alice taking it for an unapproved joyride through the “Sea of Time.” And so it is that Alice Through the Looking Glass becomes a jaunty little chase pic throughout its midsection, Time nipping at Alice’s heels as she journeys further and further back in an attempt to prevent the Hatter family’s deaths. Behind the camera, Bobin conducts these time-traversing exploits with appropriate haste, moving from scene to scene quickly enough that the more confusing aspects of Alice’s adventures never distract from their colorful, kooky energy. Up until the third act, which collapses into a race against Time utterly lacking in suspense given that only one of its two outcomes (complete annihilation or eleventh-hour salvation) makes sense for this kind of movie, Bobin and Woolverton even manage to toss in a healthy dash of verbal wit. 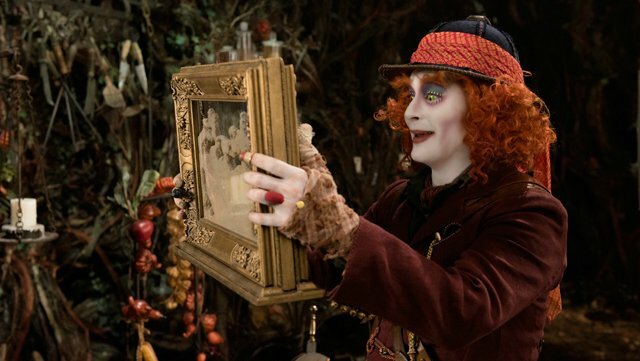 If Alice Through the Looking Glass is entirely bereft of its predecessor’s subversive darkness (as well as any fidelity to Carroll’s books), its surplus of candy-colored comedy at least connects. And visually, the film is a lavish creation, especially in terms of costume design and cinematography, going loud and over-the-top in a way that faithfully mimics the everything-but-the-kitchen-sink aesthetic of Burton’s take. It’s disappointing that some of the steampunk/high-tech visual inspirations skew too close to Transformers and even Jurassic World for comfort, but there are still moments of dizzying, dazzling spectacle that allow this sequel to pack some small wonders of its own. 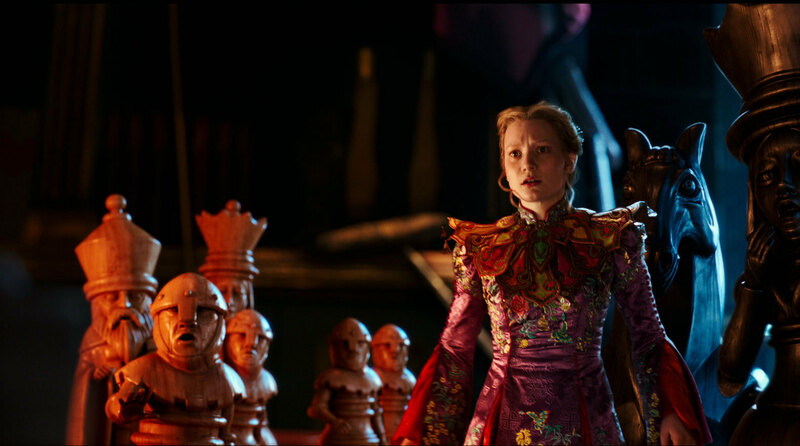 Where Alice Through the Looking Glass falls regrettably short, though, is in its hypocritical rejection of narrative imagination. No one needed or asked for pedestrian origin stories for Underland’s most divinely delirious denizens, and providing them with ones as lame as Woolverton’s only serves to rob them of the intrigue upon which Carroll’s novels thrived and Burton’s adaptation capitalized. As this sequel ticks down toward its CGI-overload finale, what becomes painfully clear is that real “wonder” hinges on a potent combination of surprise and admiration that the movie never earns or even really strives for. For all the liberties the movie takes with Carroll’s iconic books, the one that stings the most is its wrong-headed emphasis on generic formula over thrilling fantasia.